Pricing your products and services can be one of the most challenging aspects of running a business. Price too low and you may leave money on the table, or eventually put yourself out of business. Price too high and you fear that you will lose customers. Most business owners think of pricing as it relates to your general financial picture, but it’s important to understand the connection between setting your prices and developing your branding. 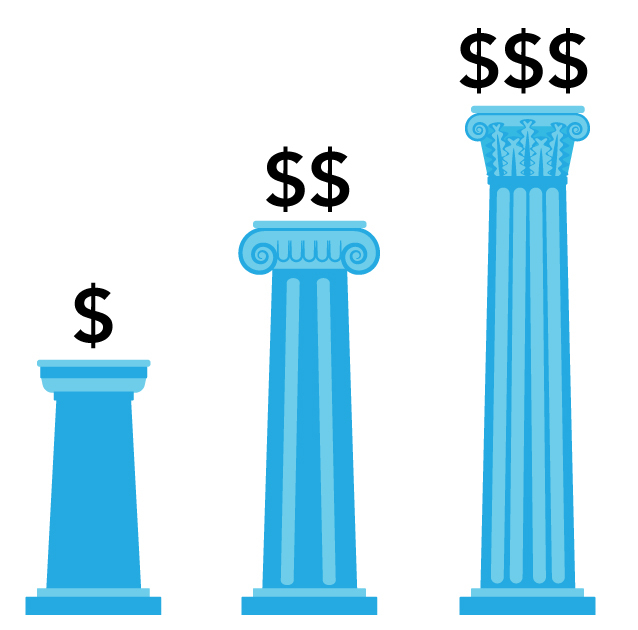 Pricing sets your expectation of the brand experience. You expect a different product and service from a Motel 6 vs the Ritz-Carlton. Think about spending a night at the Ritz compared to a Days Inn or Motel 6. Both buildings will have a lobby, and will offer rooms with beds and bathrooms. But your overall experience will be completely different. If you spend a lot of money at a hotel or resort you expect a certain level of customer service, decor, and offerings. You expect to have a large staff who will be able to assist you quickly and courteously should you have a question or concern. You expect the decor to be refined—high-quality linens, nicely decorated rooms, and a lavish lobby. You expect there to be additional offerings like a well-trained concierge, a full-service dining room, a well-equipped gym and maybe a spa. Your expectations at a low-cost hotel or motel are very different. You expect to carry your own bags to your room. You’ll overlook a slight tear in the shower curtain or feeling like the decor is a bit run down or uninspired because you didn’t pay a lot of money for the room. When you charge a lot of money, your customers will expect a higher-quality brand experience. They’ll expect a great physical space (part of the visual and experiential parts of your brand) and great customer service (this connects with the voice of your brand and your customer experience). Any materials or ingredients you put into your products must match the quality of your overall brand. The reverse is also true. If someone is unfamiliar with your product or service, the brand image you develop sets an expectation of your price. Branding is an indicator of what to expect for pricing. Think about restaurants like Five Guys burgers or Chipotle burritos. When you walk into each place, you quickly realize these are “no-frills” types of restaurants. Both use minimal decor and low-cost building and decorating schemes. Compare that to a high-end, gourmet restaurant. Your brand experience is totally different. The printed menus are a tangible, visual piece of the branding. The ambiance builds a well-planned customer experience. The waitstaff are well-informed and attentive. 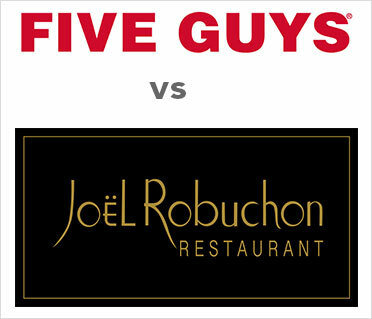 You quickly understand that you will be paying far more for your meal that you would have at Five Guys or Chipotle. thinking about the customer experience in every detail. But you don’t have to do all this. There are many people looking for more affordable options. They may also assume that luxury services are snobby and stuffy, maybe yours can be more fun and friendly. Many people are looking for products or services they can turn to over and over again to be a comfortable trusted brand experience, rather than just a special-occasion experience. It’s ok to position your product or service as family-friendly rather than fancy; simple rather than complex; or quick rather than full-service. After working with hundreds of small businesses, a common mistake I see people make is trying to offer luxury service at lower end prices. There are two typical reasons business owners fall into this trap. The first is that they believe they’ll be able to perform the same service or build a similar product for less money. This is the path to business failure. You must assume that the market leaders in your industry have taken the time to understand the business model and run the numbers on how to make a profitable business. When you undercut on price, you may attract more customers, but your margins may be too tight to make this a viable business model. Not only will you have less revenue, but as explained above your prospects will question the value of your brand compared to the more expensive brands. The second reason is that they’ve mismatched market demands with what they want to offer. I see too many business owners trying to offer a high-priced product or service when the marketplace is really looking for a more affordable option. Have you ever heard another business owner complain that “No one is willing to pay!” Make sure you take the pulse of the market before you announce how you will price your services. For example, you could open a restaurant that features meals at about $35/plate. It may be able to cover expenses, but it may be difficult to attract enough reservations to keep it going. However, if you chose to open a more casual restaurant with meals at the $15 mark, your demand will be much higher and you’ll do more overall revenues. Also, at this price point, you can reduce your anticipated costs for how you build out and decorate the space, putting you in a better overall financial position. In general, there will be a larger market for lower cost products. Tip: There are several questions in the Branding Compass workbook where you will need to think about your pricing. The product/market fit chart will help you identify if your pricing is off-base from your customer’s brand expectation.